The Harris Family Vision Foundation, Inc. is dedicated to helping those less fortunate. As a nonprofit charity, we appreciate all donations. Do you want to feel good about yourself? Help us with our charitable fund-raising drives, and we in turn will help others. Do you wonder who is the driving force behind The Harris Family Vision Foundation, Inc.? Learn more about the foundation and its staff. Daily, 7:00 a.m. - 9:00 p.m. 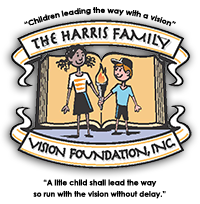 The Harris Family Vision Foundation, Inc. in Brooklyn, New York, is a nonprofit 501(c)(3) charitable organization that motivates children to develop their talents. As a Christian-based organization, we believe that helping those in need in overseas countries, such as children with disability, the elderly and the less fortunate, is the right thing to do. Your donation is greatly appreciated and tax deductible. The mission of The Harris Family Vision Foundation, Inc. (HFVF) is to encourage quality values through personal accountability and by raising the level of expectations of performance of all individuals.